There are not many businesses that can look back on a 175 year heritage. Patek Philippe has been active since 1839 without interruption and succesfull over the years. 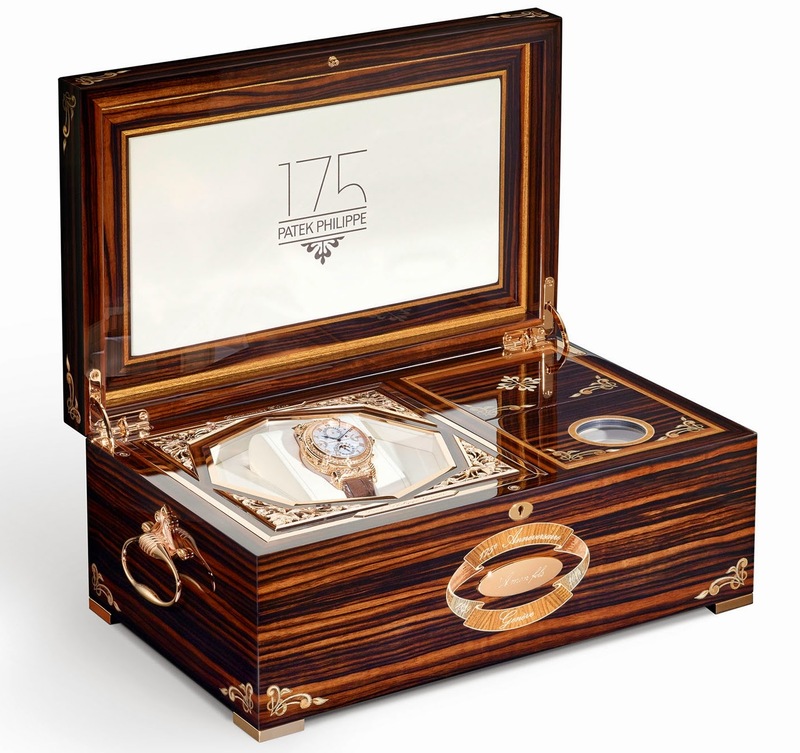 The time pieces the company created have been considered to be the finest in the world. The innovative philosophy and the tradition to keep the high standards and reputation, has made the company growing. The success behind the Patek Philippe is due to the involvement of the Stern family, who has acquired Patek Philippe in 1932. Patek Philippe is now the last independent family owned Genevan watchmaking company. To celebrate the 175th anniversary, Patek Philippe is revealing their creation of limited edition Commemorative time pieces for ladies and gents. The collection of the Commemorative time pieces contains 4 limited edition. These time pieces are created and designed from the out most legendary models and technologies of Patek Philippe heritage. These excellent time pieces have patented time zone mechanisms, highly precise moon phase display, jumping indications and chronoghraph. Among the 4 limited edition exceptional and luxurious time pieces is the Patek Philippe's Star masterpiece: The Grandmaster Chime 5175R. The star of the collection, The Grandmaster Chime 5175R, is the Haute Couture in watches and has been in development since 2007. It is not hard to comprehend considering this wristwatch contains 20 complications. The Grandmaster Chime is a double faced reversible wristwatch with a choir of chimes that have never before come together in any wristwatch. The look is majestic and so beautifully crafted with care and precision. This is a watch with an intricate inner life. There will only be 7 pieces of the unique engraved case of Grandmaster Chime 5175R ever made. 6 of these time pieces will be sold to collectors and enthousiasts clients, while the 7th will be joining the collection at the Patek Philippe Museum in Geneva. The Grandmaster Chime 5175R is a true visionary and musically triumph. This wristwatch is a true beauty, inner and outside. The format of the Grandmaster Chime 5175R is built as the Patek Philippe Sky Moon Tourbillon. However the case of the Grandmaster Chime has been engraved with beautiful and fine art work. 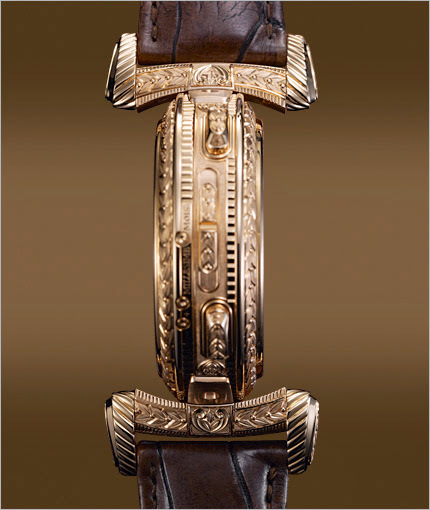 This engravings makes the wristwatch to be a class of his own, a true masterpiece. 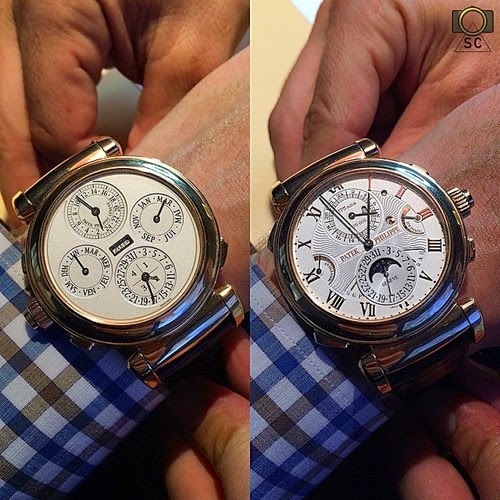 The Patek Philippe Grandmaster Chime is reversible and has 2 coequal faces that displays the time. One face gives details of the musical elements on the watch and the other is more focused on the perpetual calendar. The patented mechanism, which took 3 years to built to perfection, enables the Grandmaster Chime by Patek Philippe to be smoothly reversed in an instant and will put the watch secure into its place. The case is as sophisticated as the complex movement within. While a conventional case consists of about 12 parts, the case of the Grandmaster Chime will easily be consistant of no less than 214 components. Even though the Grandmaster Chime has a complex design, the many functions are able to operate smoothly and the chimes seems to peal with a full and resonant sound. 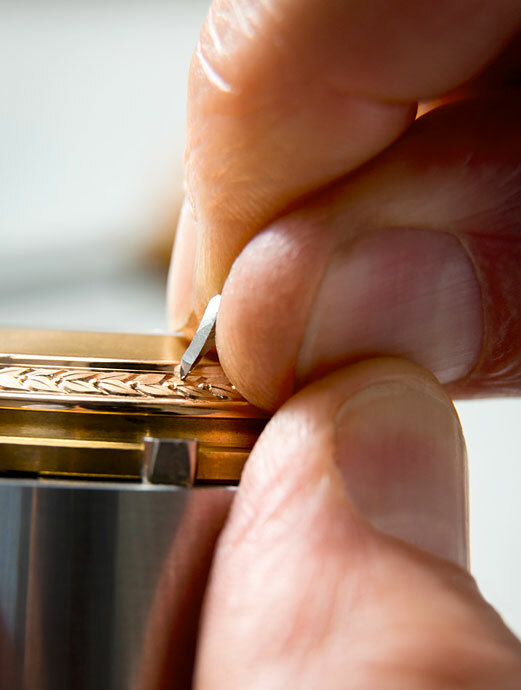 The case of the Grandmaster Chime 5175R shows the most rare handcraft skills that has been done at Patek Philippe. I wonder whether there is another wristwatch that ever been so beautifully engraved as the Patek Philippe's masterpiece. The Grandmaster Chime shows the excellent product hand made by masters of their disciplines. 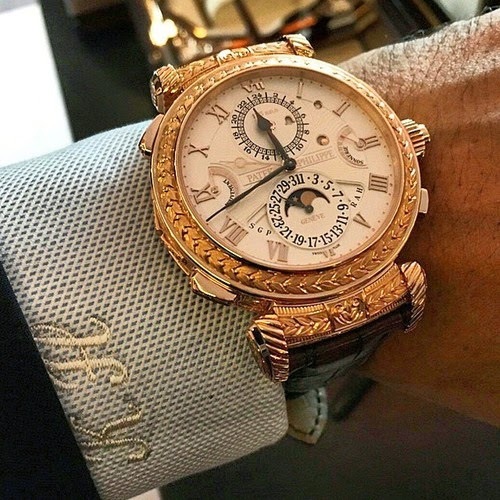 Patek Philippe's Masterpiece is made in 18 kt Rose/Pink Gold. 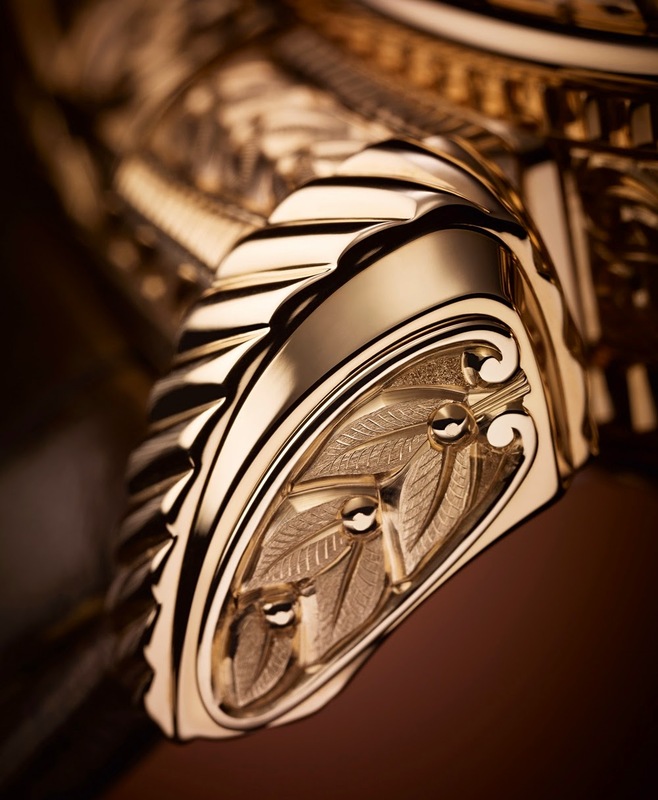 The case and the fold over claps are handengraved with laurel leaves. This reveals the rareness of the majestic and ingeniously Grandmaster Chime. The laurel leaves is a symbol for ancient victory and has been used as a crown by Julius Ceasar. The 2 dials of the Grandmaster Chime are made out of solid Gold and it is quite impressive. 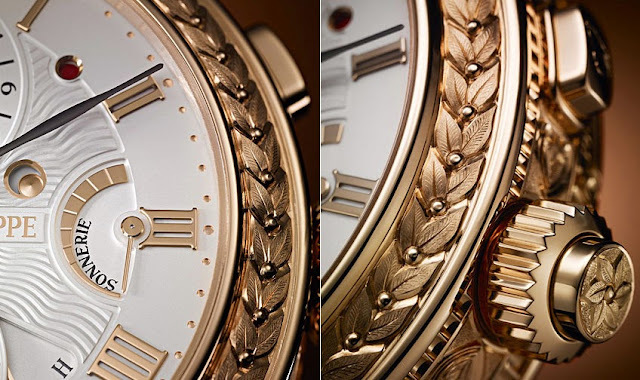 The sonnerie side of the watch has time function and it features delicate Gold appliques. Sound wave pattern is shown at the center of the dial. The honorary president of Patek Philippe, Philippe Stern has had an influence on the design of the calendar side. The design was done by his wishes and expertise. The Grand Sonnerie is the jewel in the Patek Philippe's Grandmaster Chime 5175R. It's one of the rarest of the complications that automatically chimes the hours and quarters using 3 gongs. The Grand Sonnerie also sounds the corresponding number of low pitched tones at the top of each hour. It will signals first the hour, then the number of quarters, which indicated by triple strikes on 3 gongs as well. Each quarter has it own melody. It has been very challenging to develop this complicated mechanism in a compact case of the Patek Philippe Grandmaster Chime. The challenge was using the dubble barrel, having 30 hours of reserve power and the charmingly measured gongs with the rich, crystalline sound, that Patek Philippe is well knowned for. The Grand Sonnerie can be switched off when it's not required. This masterpiece can be set to the Petite Sonnerie or in silence, when the hours will pass without a sound or even a whisper. The Grandmaster Chime 5175R uses the minute repeater that strikes sequence as an acoustic alarm signal, providing a gentle alert using the same sequence of strikes. For the first time in history of watchmaking that this was made. When the alarm is activated, then all other chiming functions will be disabled. It will remains mute until the alarm has sounded or switch off. One of the special thing that the Patek Philippe Grandmaster Chime 5175R offers, is a reminder that the alarm is activated, the color in the bell shaped aperture on the alarm dial will turn red. Once the alarm has sounded, the color changes back to white. The alarm of the Grandmaster Chime by Patek Philippe can be set 24 hours, dial at 12 o'clock and to quarter - hours accuracy. However the alarm will sound 2 minutes before preset time and quarter hour to avoid missing the required fewer strikes such as 1 o'clock. The 2 minutes before preset time, the repeater will sound at 12.58, with 12 strikes for the hours, 3 triple strikes for the quarter - hours and 13 strikes for the minutes. This acoustic time indication is very hard to miss. A date display is present on both Grandmaster Chime's dials. This Star masterpiece date repeater is a perpetual mechanism that recognizes the different number of days in each month and the leap year cycle. Therefore it will always show the right date. The rare exceptions are the secular years, which next will be in 2100. The refined date repeater also indicates the date acoustically. It signals with high and low notes for each multiple of 10 days and a single high note for each unit. The Grandmaster Chime's perpetual date repeater is created out of inspiration by Thierry Stern's conversation, that he had 10 years ago. An acoustic perpetual date repeater has never before existed, so this perfection of long standing achievement is world's debut by Patek Philippe. The Patek Philippe Grandmaster Chime 5175R is destined to hold a singular place in horological history. A unique double-dial, fully reversible supercomplication explicite wristwatch, with a total of 20 complications. With the complex mechanism and the beautiful and delicate case decoration, the Patek Philippe Grandmaster Chime 5175R is an absolute micromechanical Masterpiece. Owning one of this Star Masterpiece will certainly be far beyond the Sense of Luxury. 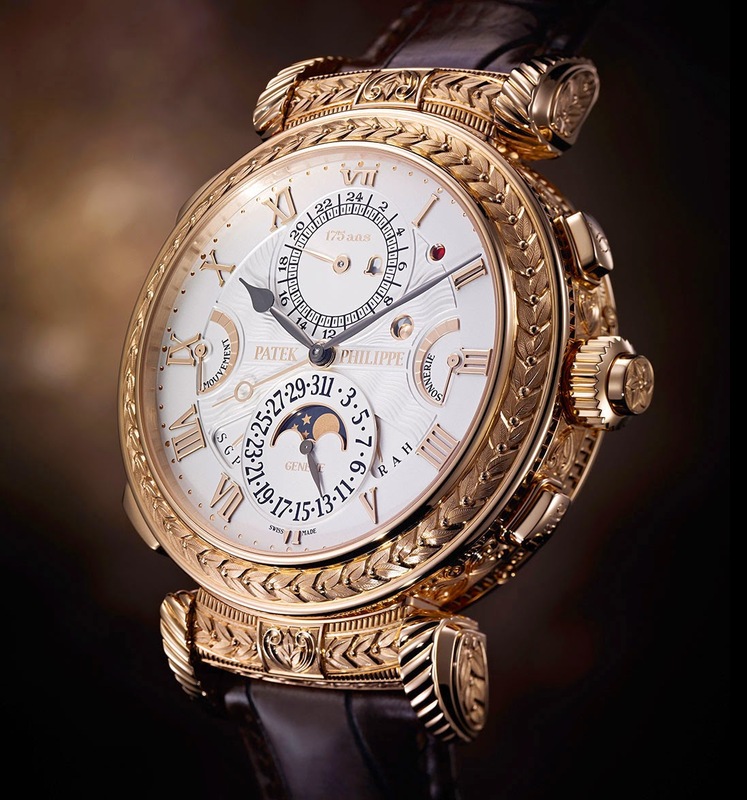 Therefore it will not be a surprise that the price of the Patek Philippe Grandmaster Chime 5175R, which is considered to be an exceptional work of art will approximately be USD$2,6 Million.